ETA: I meant to take photos of the bow technique but didn’t get to it. I will edit this post tomorrow with the photos. Sorry there is no Twinkling Tuesday post today. Come back and visit tomorrow; at least half of us were having trouble getting our posts up today, me included!! 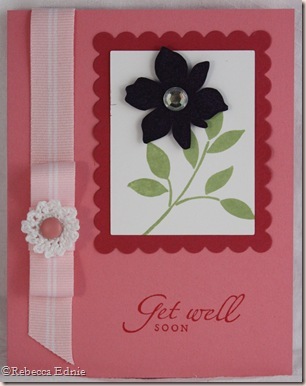 I needed a get well card for a dear old friend, Peggy, who was in hospital. The kids and I went to visit her Thursday and I whipped up this card in about 25 minutes (that has to be a record!) before we left. I probably have a get well card stashed away somewhere and tons of general cards but it was more !!FUN!! to create a new one! Stamps: best blossoms, sincere salutations–SU! Ink: eggplant, rose red, celery-SU! Paper: white, regal rose, rose red, eggplant CS-SU! Previous postOooh La La!! French Corset Card! Next postBits and Bobs of Flotsam and Jetsam!